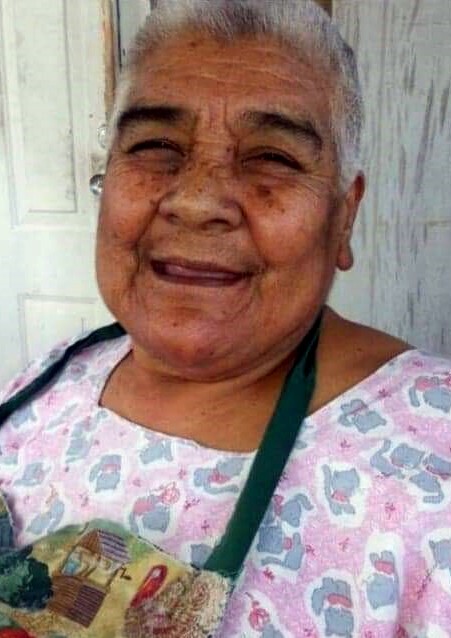 Catarina R. Robledo, 83, entered eternal rest on Friday, April 12, 2019 at McAllen Medical Center in McAllen. She was born on Tuesday, April 30, 1935 in Derby, Texas to Isabel Rangel and Antonia Gutierrez Rangel. She is preceded in death by her parents, husband; Andres Robledo, Sr., son; Andres Robledo, Jr., daughter; Norberta "Nole" Robledo and daughter-in-law; Imelda Robledo. She is survived by her sons; Ramiro (Cecilia) Robledo and Roman Robledo, grandchildren; Maria Victoria Cavazos, Ramiro Robledo, Jr., Roman "Romie" Robledo and Ryan Robledo, 5 great grandchildren. Catarina enjoyed sewing and making her own clothe. She also enjoyed going to Sonic Restaurant for a treat. She will be missed by her sons and grandchildren, but they know she is now resting in God's arms. The Robledo family will receive friends on Monday, April 15, 2019 from 8:00 AM - 10:00 AM in the Chapel of Peace at Ceballos-Diaz Funeral Home, 322 East Kuhn Street in Edinburg. Graveside services will be held at 11:00 AM at Hillcrest Memorial Park Cemetery, 1701 East Richardson Road in Edinburg. Funeral services have been entrusted to Ceballos-Diaz Funeral Home in Edinburg.